If you were thinking of building a house, this is the time when we analyse the natal chart (flying star chart as below) to determine the best locations for all doors and the allocation of important rooms in order to harness the beneficial distribution of energy. Every property will have good and bad stars; the secret is placing the good stars in places like an office, bedroom, lounge or dining room and the bad ones in places like a bathroom, en-suite, cloakroom or utility room. 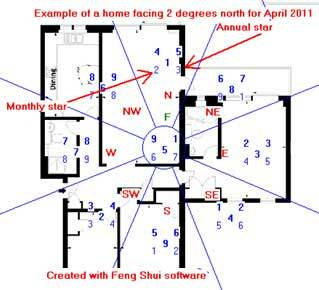 In Feng Shui terms, the interaction between the energies of each sector of a Xuan Kong chart below, “the Heavenly Heart of the House” (centre of home), will affect the well-being of the household. The main / front door. The door you use for entry and exit frequently or on a daily basis. The sector where your office is located within the building. Your bedroom location within your property. The rooms that are used frequently where most activities, noise and movement are, e.g. kitchen, living room, study or the playroom. Hopefully you have your 2011 annual cures and enhancers in place to ensure a smooth year ahead, if not please follow this link for more details. The annual cures can be placed at any time of the year up until February 2005. Please do not panic when you find that your bedroom is located in an affected sector for the month. This is only a temporary influence and can be avoided. If you cannot avoid the room completely, then try to use the good small sectors (tai chi) of the room. Avoidance is the best cure. Simply be aware of the potential influences of the sectors. This update is merely to prepare you by informing you of the intangible forces of energy that exist in each sector of the house and how these may influence your performance. If your main door is affected and this is only the door you have in your property, you should take extra care in what you do during the affected month. You will know it may not be a good time to take risks and to take extra care of your health. The inherent properties of the elements of a 3-2 combination in the north palace this month indicate that health and legal issues are more pronounced. Especially with elderly residents, they must take extra care in whatever they do and try to stay healthy during this month and be very careful when signing papers. We have a more auspicious #6 star enter the centre this month of April and hopefully bring better times for many . Be careful in April if your main door, bedroom or office or any important room is located in the northwest, north, southwest or southeast this month. If your office, main door or bedroom is located in the north or southeast make sure you place a Wu Lou or six Chinese coins tied in a row with red ribbon for the month of April especially if you are not in good health or feel very stressed. If you have a main door, lounge, office or any other important room in the southwest please be careful signing papers as there could be treachery in April, just be careful and read all the small print. You can also suffer from someone trying to back stab you or steal from you so place something that is red in colour in the SW such as a rug, door mat, sofa throw etc; this will help calm this negative influence. If you use our monthly cures kit place a wu lou and set of six Chinese coins tied in a row with red ribbon in the north and southeast especially if you have an important room like a bedroom, office, main door etc. The north is not that great this month as we have a # 2-3 star combination which can cause problems so try and keep the north quiet this month and introduce a small amount of good quality metal like a set of six Chinese coins in a row, a wu lou or a signing bowl or any other good quality round metal object but make sure you remove it at the end of the month. Please also be aware that Grand Duke is in the east in 2011 again and you must not disturb the ground, so no renovations or such like especially this month. place some strong water colours in the northwest (blue and or black) especially if this is an office or bedroom, in fact if you have a bedroom or office in the northwest you should place a bowl of still water in this room, the water must be still and changed every couple of days and daily if you live in a very hot dusty country. Good sectors for the month of April are the west, south, northeast and east and if your door, office, bedroom or any other important room is located in these areas your month will be good in April. Take a look at the annual cures and enhancers of how you can enhance your month and year even further. To activate relationships in April you can place something dark blue or black in colour in the east. A quick and easy way of introducing the colour is placing a sofa throw, bed cover, rug, table cloth; it is actually very easy if you think about it. If you use symbolic items in relations you can place a pair of Mandarin ducks or double hearts in the east this month. With regards to wealth you should spend more time in the west of your home or office and enhance the west by placing a faceted crystal sphere and/or a real piece of quartz crystal. If you are using our annual cures kit you should have the sheng chi enhancer with Jasper Brecciated quartz crystal in the west, this is perfect and will also enhance your wealth this month. To prevent legal issues, disputes, gossip and arguments with partners in love or business, introduce something red into the southwest corner of your home and bedroom or office in April, a quick and easy way of introducing the colour is using a sofa throw, bed cover, rug etc, you can also light a small candle daily if you are experiencing problems on this front but please be very careful with candles and tee lights. To further ensure a smooth month ahead in December and for more information on the monthly Almanac and choosing auspicious days follow this link.